“Other agencies don't ask us where we got the information from and we don't ask them. That way they can protect their top politicians from the backlash in case it emerges how massively people's privacy is abused worldwide,” he said. Snowden gave the interview to a cipher expert and a documentary filmmaker with the help of encrypted emails shortly before he rose to global fame, Der Spiegel reported. The publication recollected that the US Army is simultaneously in the process of building a base in Wiesbaden, southwest Germany, claiming it will be used as an intelligence center by the NSA. The four-story bug-proof spying center is made from imported American materials and costs $119 million. Its construction will allow for the closure of over 40 existing sites across in Heidelberg, Mannheim and Darmstadt, US Army Garrison Wiesbaden spokeswoman Anemone Rueger told Stars and Stripes. The Der Spiegel report also indicates that the German Federal Intelligence Service, the Bundesnachrichtendienst (BND) and NSA work very closely together. It was revealed at the end of June that the US combs through half a billion of German phone calls, emails and text messages on a monthly basis. An earlier report by Der Spiegel, also based on revelations by Snowden, revealed that the NSA bugged EU diplomatic offices and gained access to EU internal computer networks. Chancellor Merkel’s spokesman, Steffen Seibert said that this would constitute intolerable behavior if proven. “If it is confirmed that diplomatic representations of the European Union and individual European countries have been spied upon, we will clearly say that bugging friends is unacceptable,” said Chancellor Angela Merkel's spokesman, Steffen Seibert. “We are no longer in the Cold War,” he said. Germans are particularly sensitive about eavesdropping because of the hangover from the intrusive surveillance state which characterized the communist German Democratic Republic (GDR) and Nazi era totalitarianism. The Der Spiegel report claims that the NSA provides the BND with analysis tools to monitor data passing through German territory. Opposition parties insisted when revelations were made about the extent of espionage that somebody in Merkel's office, where the German intelligence agencies are coordinated, must have known what was going on. BND head Gerhard Schindler confirmed the existence of the two country’s intelligence partnerships during a meeting with members of the German parliament’s control committee specifically for overseeing intelligence issues, according to Der Spiegel. The BND is legally allowed to look through 20 percent of transnational communications, in addition to monitoring internet search terms and telecommunications, Deutsche Welle wrote on June 30, while the US can essentially capitalize on Germany’s data collection packets. The cooperation includes the passing of data over areas deemed crisis regions. The BND lacks the capacity to fully use its legally allowed monitoring. Der Spiegel reported that the agency is currently only monitoring only about 5 percent of data traffic, but is planning to expand its server, capacity and staffing in order to be more effective. The Federal Office for the Protection of the Constitution, which overlooks domestic counter-espionage, is currently investigating whether the NSA has access to German Internet traffic. A preliminary analysis was inconclusive. “So far, we have no information that Internet nodes in Germany have been spied on by the NSA,” said Hans-Georg Maassen, the president of the Office for the Protection of the Constitution. NSA whistleblower Edward Snowden fled the US in May a few weeks before his first leaks were published by the Guardian. He is believed to have been holed up in Moscow airport since June 23 and initially made asylum requests to 20 countries, including Germany, followed by a further six. 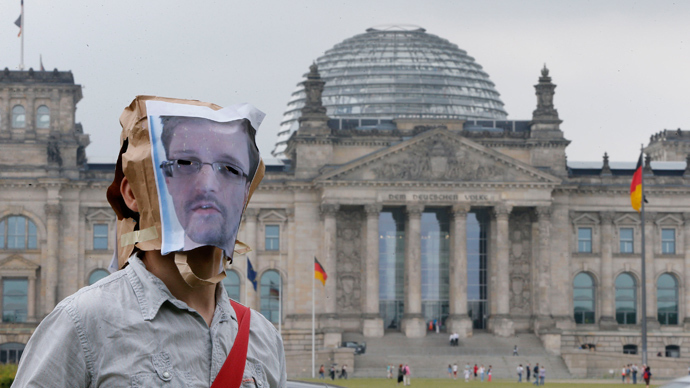 Snowden was refused asylum in Germany on the grounds that asylum requests must be made on German soil.